When the Kid’s Choice Awards rolled into Hollywood, it brought plenty of starlets along with them. Actors, musicians and athletes alike came out to present and perform, while possibly getting slimed in the process. This awards show is all about bright, fun looks, and this year’s crop of couture was no exception. "Victorious" star and KCA winner Victoria Justice was one of the stars who brought a punch of color to the purple carpet, and her bright Pia Pauro dress was a perfect way to do it. Victoria’s colorful mini dress was a super appropriate look for the KCAs, as she looked youthful and fun but also fashion forward. Her printed dress is right on trend for spring and summer, as prints are sure to be popping up everywhere soon, not to mention tribal prints like the one Victoria is sporting here. A pair of bright coral Aldo heels added another pop of color to Victoria’s look, fitting right in with the colors in her dress and standing out in a good way. Accessory-wise, the actress kept things simple, letting her dress and shoes do the talking, accessorizing with only one gold bracelet and a neutral clutch. 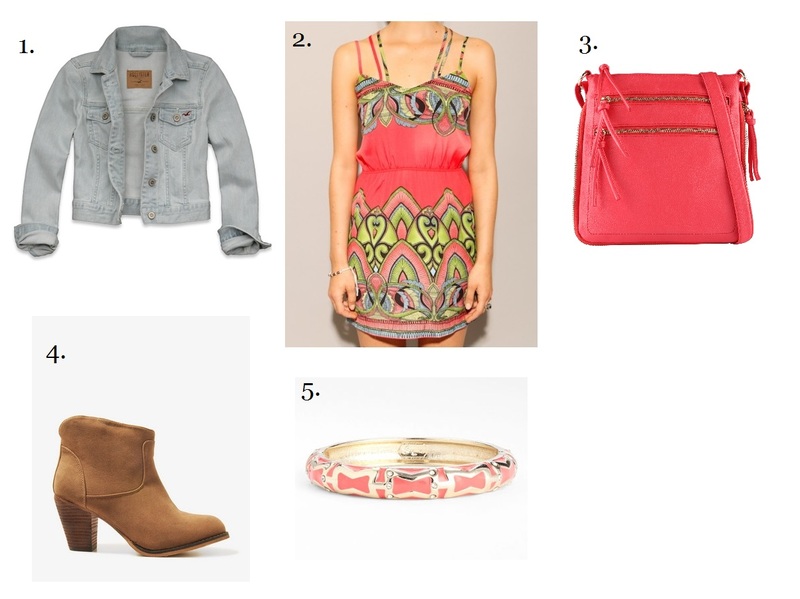 A bright tribal printed mini dress calls for ... a bright tribal printed mini dress! A more casual version of Victoria’s frock, this dress can be dressed up or down depending on the occasion. For day, it pairs perfectly with a denim jacket in a super light wash with the denim bringing out the blue in the dress. A sundress is a great item to wear with a denim jacket, since there is no other denim involved in the outfit and thus no danger of doing denim on denim the wrong (because there is a right) way! Instead of a neutral clutch and bold heels like Victoria chose for her awards ensemble, this outfit is getting a neutral pair of boho booties and a super bright coral cross body. These accessories are chic statement pieces on their own, but their one color palette lets them accent and not overwhelm the printed dress, which is the focal point of this look. An enameled gold bangle with a pop of color echoes Victoria’s simple piece of jewelry, and accessorizes this outfit just enough to keep it from looking unfinished. To finish off the look, try some loose curls like Victoria did, or just throw it all up there in a messy bun. You’ll be looking effortlessly cool in no time!